Rediff.com » Movies » Vote! The Best Harry Potter Scenes! Vote! The Best Harry Potter Scenes! He came, he saw and he conquered the imagination of millions of kids and adults all over the world a decade ago. Harry Potter grew with his legions of fans over the years and weaved his magic in the blockbuster book and movie series. But it will all end next week with the release of the last film in the franchise -- Harry Potter and the Deathly Hallows Part 2. We look back at some of the best scenes in the Potter movies. Click through the slide show and vote for the scenes that you particularly loved. 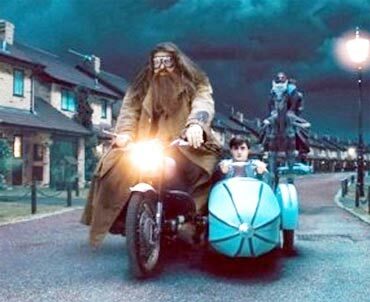 It all started with Hagrid journeying to meet Harry. He informs Harry that he's a wizard and has been accepted at the Hogwarts School of Wizardry and Witchcraft. Although Harry doesn't know who Hagrid is, it's quite a reunion for Hagrid -- the genial half-giant who takes care of Harry in his most vulnerable moments in future -- with the Dursleys, who had taken in baby Harry when his parents had been killed. And who can forget the expression on little Harry's face when he learns that he's a wizard. 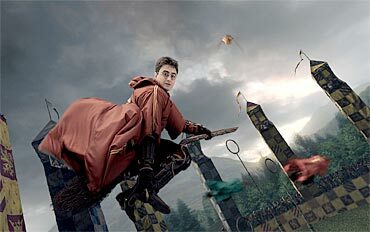 The first time that the Hogwarts students learn how to mount their brooms and fly is truly an entertaining scene. The training finally leads to their first quidditch game, which was a visual treat. The way Harry and his friends respond to the whole experience is endearing and makes us wish we had magic brooms too. In Harry Potter and the Philosopher's Stone, Harry encounters Voldemort while trying to find the stone. 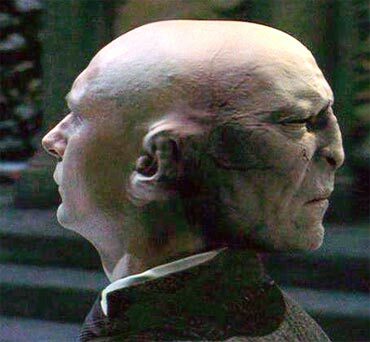 Voldemort is temporarily living at the back of Professor Quirrell's head and meets Harry when the turban is removed. His voice is menacing enough to scare the living daylights out of anybody. Also, there was a whole build-up before Voldemort is finally introduced and that also made this scene thrilling on certain levels. When the Chamber of Secrets opened in the second film, all hell broke lose at Hogwarts. The ghost of Sir Nicholas got Petrified while Ginny Weasley was taken inside the Chamber. With Dumbledore facing suspension and Hagrid facing accusations of having opened the Chamber, Harry and Co set out to solve the mystery. 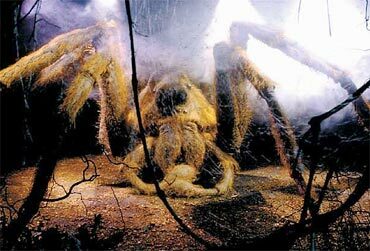 The leads take them to a gaint spider called Aragog, a friend of Hagrid's, who lives in the Forbidden Forest. Aragog's sons and daughters attack Harry and Ron, but the latter's flying car saves them. 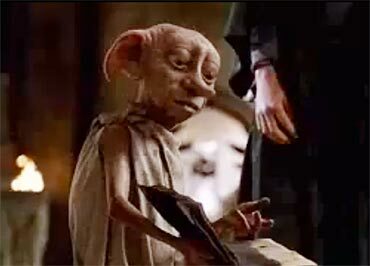 Dobby is briefly introduced in the first film itself, but he appears sporadically through later films too. He's a grateful elf, who stays loyal to Harry till the end. The incident that makes him so loyal of course, is when Harry frees him from his tyrannical master Lucius Malfoy by tricking Malfoy into giving Dobby a piece of clothing -- a sock. Malfoy is obviously furious about losing his house elf, but it makes Dobby the first free elf. In Harry Potter and the Goblet of Fire, Hogwarts students attend their first Yule Ball. It's also the time when Harry and his friends are just entering adoloscence. When Hermoine enters the ballroom in her pretty gown, she looks nothing like the curly-haired kid that she used to be. Instead, we get a glimpse of the stunning woman she will turn out to be. Seeing her in the arms of her date Viktor Krum, Ron fumes silently, making us aware of his new-found feelings for her. 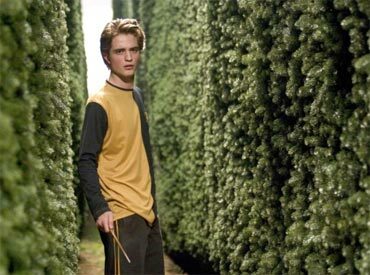 Cedric Diggory is a true hero and although he's overshadowed by Harry Potter's popularity at times, he still remains admired by the students at Hogwarts. Besides, he's by far the cutest guy in Hogwarts! So everybody's stunned when he gets killed by Lord Voldemort once the Triwizard cup transports him and Harry to the graveyard, where the Dark Lord was waiting. Although he appears briefly, his is one of the most memorable characters in the series. Harry is busy raising a secret army to help Dumbledore but he finds time to romance classmate Cho Chang. Harry's first kiss takes place in the room where he trains his schoolmates. It's an electrifying moment, more so for fans as this happens to be a milestone in Harry Potter's coming-of-age story. It came as quite a shock when Harry's godfather Sirius Black is killed by Bellatrix, his cousin and a Death Eater in Order of the Phoenix. 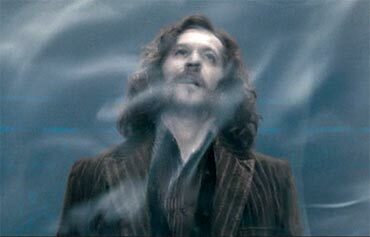 His sudden death devastates Harry, especially since Harry considered him family. And the biggest shocker of all came when Severus Snape, Dumbledore's man Friday kills him in Harry Potter and the Half Blood Prince. Just when all the doors seem to be closing for Harry and he's most vulnerable, his biggest source of strength gets killed and that had us on the edge of our seats, gasping.